The Appalachian region is a fascinating and beautiful place. Below is an overview of it’s culture and history written by Bill Barker, of Appalachian Regional Ministries. Used with permission. The Appalachian mountaineers have been discovered and forgotten many times. They first attracted national attention during the Civil War. Their primitive agriculture disrupted by foragers and incessant guerrilla warfare, thousands of them straggled out of the mountains in search of food and shelter. Their plight was brought to the attention of President Lincoln, who promised that after the war a way would be found to aid the poor mountain people whom the world had bypassed and forgotten for so long. The war ended, President Lincoln was assassinated, and Appalachia was forgotten. Appalachian people are considered a separate culture, made up of many unique backgrounds – Native Americans, Irish, English and Scotch, and then a third immigration of Germans and Poles – all blended together across the region. The mountains also figure into the uniqueness of Appalachia. The mountains kept Appalachia isolated from the rest of the country and from other people’s involvement in their lives that they developed a distinctive culture. Appalachians are very independent, they are very contented with the places that they live, they are very close to nature, they have a deep sense of a belief in God, and they have a deep sense of being friendly and kind to one another and helping one another, and taking care of everyone else in their needs. Appalachians also have a strong sense of what is right and what ought to be and a deep mistrust of anyone who is new, anyone who is a stranger. They resist change. Appalachia has a very long history of exploitation. The struggle continues as each new chapter is written. The area is extremely rich in natural resources, one of which might be considered its people. However, though fabulous wealth has been generated in Appalachia, the mountaineer’s share in it has been held to a minimum. This beautiful region of steep wooded hills, narrow valleys, and winding streams is a land of contradictions and tragedy. Appalachia has become synonymous with destitution and illiteracy, containing some of the poorest counties in the nation. Appalachian culture is a real and functioning culture that is revealed through its arts and crafts, traditional music, traditional foods, its customs, its traditions, and its somewhat common language. Traditional foods such as greens, potatoes, and beans with cornbread and biscuits are the norm. The Appalachian culture that we witness today is one that has been preserved mostly by the families and the churches. The constant attempts by the “outlanders” to change this culture are testimony to the determination and strength that persists in this culture. This culture is based on subsistence agriculture and hunting, not on industrial class structured ways of existence. The two key factors of the culture of Appalachia are the independence displayed and the constant mutual aid provided to others in the region. There is a sense of equality that exists between the people; this is of course in sharp contrast to the inequality and elitism that exists in other areas of modern society. Culturally, there are four distinctive people groups in Appalachia. To fully understand Appalachia, it is important to recognize this diversity. One of the people groups consists of descendants of the original pioneers who settled in the region during the westward movement. These people tend to be landowners, politicians, and business people. The characteristic traits of this group are self-reliance, independence, hard working, stable, and strong family ties. A second group is composed of the hard working coal miner, logger, or factory worker. They average worker has little education, few skills, a large family, no wealth, and few choices of vocation. While, for example, coal mining continues to be the largest financial contributor to the economy of West Virginia, poverty in the coalfields remains a daily and depressing reality. The third group is the profession group. These are individuals and their families who have moved to Appalachia due to the profession (i.e. bankers, lawyers, teachers, ministers, etc.). Members of this group are usually not readily accepted by the Appalachians. he fourth group is the returning Appalachians. This group consists of those who grew up in the mountains, moved away for employment, and are now returning to Appalachia. Many of them find it difficult adjusting to the lifestyle they left as a teenager. Appalachians expect other to respect their freedom. Independence and self-sufficiency are very important characteristics of the people in the region. The friendly greetings and helping hands offered to strangers by the majority of Appalachians will impress the short-term visitor. One should not be misled by their friendliness. Mountain people as a whole are resistant to change, slow to accept outsiders, and are very reluctant to accept authority. This region called Appalachia stretches from Pennsylvania to Mississippi and encompasses many cultures, all of which have some common values. The cultures are self-sufficient and independent. They have survived influxes of “outlanders” seeking coal, timber, natural beauty for recreation, and cheap labor. Many barriers exist within this culture when it comes to business support. Entrepreneurship often suffers because of geography, the learning styles of entrepreneurs from this region, the workforce quality, the perceived negative attitude toward success, the regional insularity, and the general information available about capital. Some notable elements of our Appalachian culture still survive. Many cultural traditions still survive like group games, homemade objects, storytelling, home and herbal remedies, clogging and flat foot dancing (a form of dance where the rhythm of the music is beaten out with the feet), tool making, basket making, quilting, and traditional music played on handmade instruments such as banjo, fiddle, and dulcimer. Many elements have been lost due to urban influences, changing times, or the mere facts of embarrassment or shame. Many modern day Appalachians try to distance themselves from the “hillbilly-ness” that is associated by “outlanders” to the inhabitants of this region. Many young people try to forget the traditional ways and notions and adopt the new ways of thinking. The language spoken in Appalachia is unique also. It is thought to be a blend of Scottish flavored Elizabethan English directly related to the migration patterns of early settlers from these regions. American film and television have done much damage to the image of the Appalachian culture. Displayed by such films as “Deliverance”, and such television shows as “The Beverly Hillbillies” and by the comic strip, “Li’l Abner”, Appalachian people were viewed as hopeless but proud, desperate but industrious, noble first generation frontier people, yet somehow ignorant and degenerate. This was in strong contrast to the way this region was originally described in the 1890s in terms of romantic wonder. The word Appalachia is an old Indian word and it has a real definition – “endless mountain range.” The Indians thought the Appalachian Mountains went on forever and ever and ever. Today, Appalachian people are more diverse than ever, both rural and urban. Nevertheless, they share a common pride, common values, and a common heritage. The people in this region have suffered from industries such as oil, coal, mining, timber, and others. Having extracted the resources from this region and enjoyed many years of prosperity, a lot of of these industries have left, leaving the landscape scarred yet beautiful, exploited yet underdeveloped. Even after all this, you will still find a people that are proud of strong family values, self-reliance, and pride. The federal government today defines Appalachia as parts of West Virginia, New York, Pennsylvania, Maryland, Virginia, Ohio, Kentucky, Tennessee, North Carolina, South Carolina, Georgia, Alabama, and Mississippi. It incorporates 397 counties in 13 states, covers a total of 195,000 square miles, and has a current population of over 20 million. While religion is important in Appalachia, the reality is that better than 65% of the region is unchurched. Some counties are as high as 80% unchurched. Culture and religion are interwoven, and while mountain people believe the Bible, respect the church, and welcome anyone who comes in the name of the Lord, the organized aspects of religion have not been important factors to the people of Appalachia. 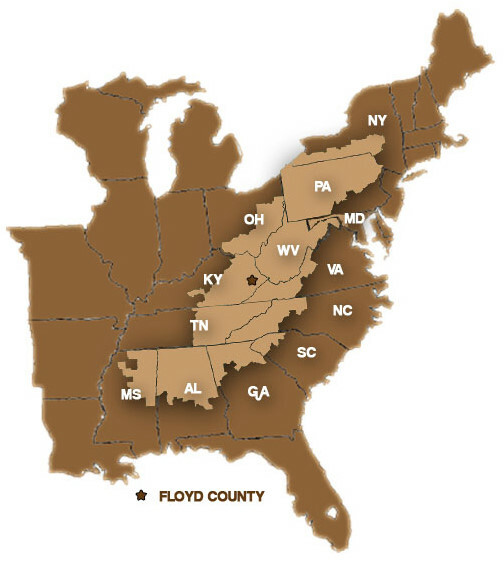 Appalachia as a region stretches from New York to Mississippi and incorporates 397 counties in parts of 13 states and the whole of West Virginia, covering a total of 195,000 square miles. Over twenty million people make their home in this region. Appalachia is an old Native American word that means “endless mountain range” that has become synonymous with poverty and illiteracy; the region contains some of the poorest counties in the nation. A film (DVD) on the history and culture of Appalachians that features Johnny Cash in his last film interview. Also features Rosanne Cash, Loretta Lynn, Little Jimmy Dickens, Marty Stuart, Ricky Skaggs and others. A unique portrait of the language and life of the Southern Appalachian Mountains. The true story of Appalachia is told through candid interviews and performances. The songs, stories, and candid interview convey a shared sense of place and identity that continues to define mountain people, even as their culture seems to be disappearing into the modern world. In Coalwood, West Virginia, all the boys grow up to be coal miners and Homer Hickam has no reason to think he’ll be any different. Too small to earn a football scholarship, Homer has no way out of his predetermined life — until the soviet satellite Sputnik flies over the October sky and changes everything.It’s 1957 and Homer’s world just got a lot bigger. Though his father is mine superintendent and has no greater wish than to see his sons follow in his footsteps, Homer embarks on a mission to build and launch his own homemade rockets with the help of his loyal band of friends. Though their frequent mistakes nearly get them shut down, their successes inspire the whole town to believe that miracles can happen even in Coalwood, and there’s nothing wrong with shooting for the stars. *These movies, books, and links do not necessarily reflect the views of God’s Appalachian Partnership, it’s Board of Directors, and staff. These resources are offered as a service to encourage a deeper understanding of Appalachia. In Coalwood, West Virginia, all the boys grow up to be coal miners and Homer Hickam has no reason to think he'll be any different. Too small to earn a football scholarship, Homer has no way out of his predetermined life -- until the soviet satellite Sputnik flies over the October sky and changes everything.It's 1957 and Homer's world just got a lot bigger. Though his father is mine superintendent and has no greater wish than to see his sons follow in his footsteps, Homer embarks on a mission to build and launch his own homemade rockets with the help of his loyal band of friends. Though their frequent mistakes nearly get them shut down, their successes inspire the whole town to believe that miracles can happen even in Coalwood, and there's nothing wrong with shooting for the stars. *These movies, books, and links do not necessarily reflect the views of God's Appalachian Partnership, it's Board of Directors, and staff. These resources are offered as a service to encourage a deeper understanding of Appalachia.